Question: Can -You- Feel the Sunshine? 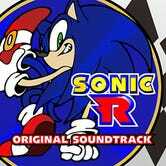 Sneaking in under my radar is the fact that the Sonic R soundtrack is now available for purchase on Amazon and iTunes. With summer coming up, don't you feel that aching in your chest? It isn't aching because of any dangerous medical conditions. It's aching because it needs 90's Eurodance goodness. Made by Traveller's Tales (Sonic 3D Blast, LEGO Star Wars) for the Sega Saturn, Sonic R also saw a release on the PC and that version was used for the port for Sonic Gems Collection. The soundtrack by Richard Jacques featured vocal performances by TJ Davis. She originally sang the Jacques-written lyrics for the song used at the E3 reveal, Super Sonic Racing. Yuji Naka of Sonic Team liked her performance so much he got her to sing on all of the tracks. The music was fairly divisive at launch, but vocal and instrumental-only options were offered in game. In a neat touch, you could listen to the soundtrack directly from the game CD, which is where the copy on my PC comes from. Super Sonic Racing and other tracks from the game have seen remixes and appearances in later Sonic games with music by Richard Jacques, most recent being Sonic and All-Stars Racing Transformed. Super Sonic Racing also appeared in Super Smash Bros. Brawl as an option for the Green Hill Zone stage. I may love the game, but I know it isn't a good one. It only had five courses and the controls aren't great, but that soundtrack has stuck with me for years. So the question remains: Can you feel the sunshine? Here's the Amazon.com link, search for regional sites and iTunes. Note that if you do have chest pains then Eurodance withdrawal may not be the cause in which case you should seek medical attention if the music does nothing for you. About the writer: Ellen J Miller is a grizzled veteran of the console wars, fighting for SEGA since 1991. Some say she went mad after SEGA surrendered and can only be placated by music from their games. If you see @EllenJMiller on Twitter do not approach her and do not call Vampire: Master of Darkness a poor Castlevania clone within earshot.